Without a doubt, asparagus tops the list of favorite spring vegetables. In addition to being a potent detoxifier and potential cancer fighter, asparagus is rich in other key nutrients, including vitamins K, C, and E, folate, copper, selenium, thiamin, and riboflavin, along with fiber and phytonutrients to help promote brain health and squelch free radicals that contribute to aging. 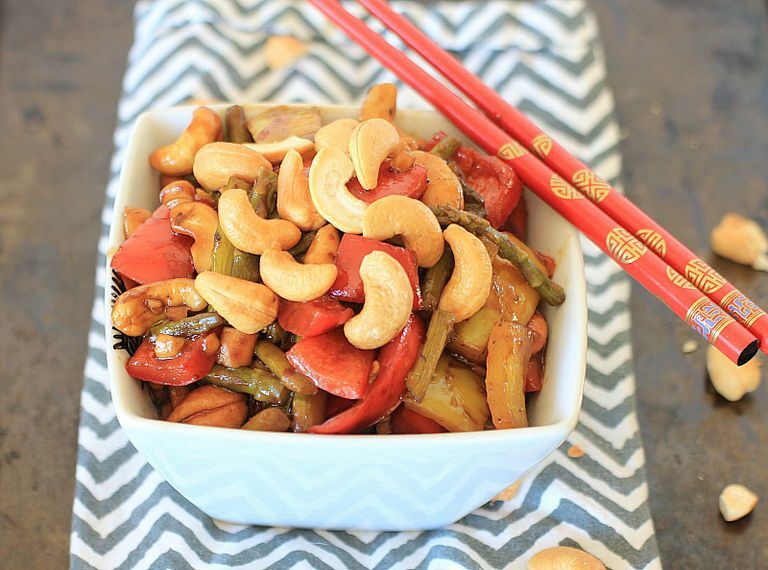 While roasted asparagus is the go-to, it's fun to try it in stir fry along with crunchy red and yellow bell peppers, heart healthy cashew nuts, and a sweet and tangy sauce, inspired by one of my favorite Asian dishes: Kung Pao Chicken. Luckily, a wide variety of gluten-free Asian sauces are available these days, so you should have no trouble finding the ingredients to make this dish. Rich in glutathione, which is full of antioxidants and thought to stimulate the immune system, this easy gluten-free vegetable stir-fry is a nourishing and delicious way to enjoy one of spring’s beloved vegetables. Make the sauce: Combine broth, vinegars, hoisin sauce, tamari, chili garlic sauce, sugar, and cornstarch in a medium mixing bowl. Stir with a fork or whisk until ingredients are well combined. Set aside until ready to cook vegetables. Prep asparagus and bell peppers. Chop into about 1-inch pieces and set aside. Mince garlic and set aside. Chop cashew nuts. Heat wok or large cast iron skillet on medium heat. Add cashew nuts to wok/skillet and cook over medium heat, stirring constantly for 2 to 3 minutes or until lightly toasted. Remove from wok/skillet, and set aside in a bowl until ready to use. Add sunflower/vegetable oil to hot skillet along with asparagus and minced garlic. Cook over medium heat for 3 minutes, stirring constantly. Add bell peppers, and cook an additional 2 minutes, then pour sauce over veggies, and continue cooking for 2 to 3 more minutes or until sauce thickens. Stir in sesame oil and cashew nuts and divide into 4 servings. Enjoy while warm. Cashew nuts can be substituted with almonds, peanuts, or your favorite nuts if desired. Coconut aminos or Bragg’s Liquid Aminos, both of which are gluten-free, can be substituted for the gluten-free tamari. Choose thin stalk of asparagus which will cook quickly. Enjoy this recipe on it’s own for a light lunch, as a veggie side dish, or on top of regular rice or cauliflower rice for a nourishing and delicious meatless meal.